Mcfarlane Toys and dead rock stars are like Captain Crunch and milk. Maybe that's not completely fair - somehow, the members of KISS have managed to avoid the Grim Reaper, and half of the Beatles are still kicking. Yet the majority of the music figures produced by McToys have been of the "live fast, die young, don't necessarily leave a good looking corpse" variety. There's been Jimi Hendrix, Janice Joplin, Jim Morrison, and Jerry Garcia. And we all know that Ozzy died years ago, and was re-animated through some sort of deal with the devil. Oh, sure, there's also Alice Cooper, Angus Young, and Rob Zombie, but that screws up my theory so I'll ignore them. The latest in this list of deceased stars is Elvis Presley. I'm not a huge Elvis fan, and yet within less than a week I do two reviews related to the King - last week's Bubba Ho-Tep movie review, and tonight's review of the McToys 68 Comeback Special figure. Joe at Killertoys.com was nice enough to send this guy along - I'm assuming the usual retailers like Wal-mart, Toys R Us, Sam Goody, Media Play and Meijers will get them in as well within the next week or two. 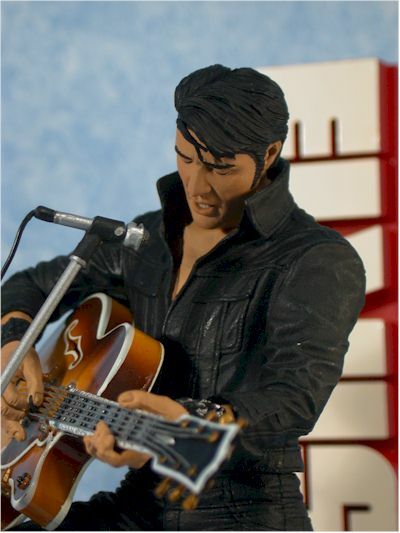 There are two more Elvis figures planned for this year, including his young rock-a-billy version, and his older Las Vegas version. It's a hunka, hunka burnin' clamshell, baby. I've made it clear that I love clamshell packaging - tremendously sturdy, shows of the figure great, and it's even easier for MOCers to store and display. McToys could boost themselves to the four star level though if they'd just take the time to include some more text on the insert. Is it really too much to ask to provide greater background info on the historical significance of the television show this figure is based on to Elvis' career? People who aren't major Elvis fans would appreciate the additional effort, and it certainly couldn't raise the cost all that much. I would like to point out that they used an actual photo of Elvis from that night on the front, right next to the toy. This takes a pair, since it allows you to directly compare the real Elvis to the sculpted Elvis. You have to give them credit for believing in the quality of their work. 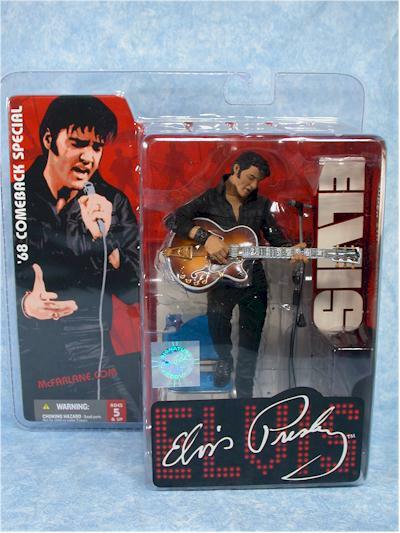 Elvis fans should love this particular figure. The show was crucial to reviving his career in the late sixties. Elvis was the teen idol of the 50's, but a decade later he'd lost his cool. But this television special, with just Elvis (and just a couple other guys to accompany him), a guitar and a small, intimate audience was marketing genius. Maybe it was the chance for his personality to come through once again, or maybe it was just the black leather (always a smart choice), but whatever the case, it catapulted him back to star status. McToys has done an amazing job of capturing a moment in time with this sculpt. 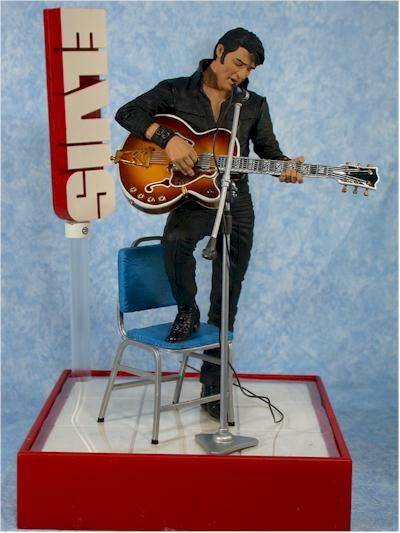 Elvis is mid-song, standing in a relaxed pose with his foot on a chair, head tilted to the side, and eyes closed. Yes, that's right - his eyes are closed. Now, I'm sure this isn't a first, but I'm hard pressed to remember another action figure (or 'plastic statue' for that matter) that was sculpted with the eyes closed. The eyes are the most crucial aspect of the human appearance. Looking into someone's eyes tells you so much, and provide so much expression and emotion. Here, we don't have that aspect, and yet they've pulled it off extremely well. You can still see the emotion, you can still get the impression of realism, even without the baby blues. Also keep in mind that this isn't a cleaned up roto-scan (obviously). This is from scratch work, based on the show itself, and that makes it all the more impressive. The style is rough though, with few soft edges. You'll notice some roughness to the hands particularly, but it's there in other places as well, particularly in the texture of the skin. The hands are sculpted to hold the guitar, and have a nice, natural pose. The guitar also sits well on the figure, although it's a completely separate accessory. In general the paint work is very clean and neat. The skin tone seems about right, and the black leather is consistent and even. They've gone the extra mile and given the black boots a high gloss shine to differentiate them from the pants and jacket, and some of the small detail work like the zippers on the boots and buckles on the wrists bands is really amazing. Not everything works perfectly, such as the wash on the blue chair. It doesn't highlight the wrinkles in a truly realistic manner. The skin is a little gloppy in a few places, and some of the small details aren't quite as good as others. But overall it's very impressive, and you're not going to be disappointed. If you're looking for a great looking ten dollar plastic statue of Elvis, look no further. But if you were expecting an Elvis who could jump into a karate stance, look elsewhere. Elvis has very limited articulation, with neck, shoulder, and cut forearms. He's designed to look good one way, and the arm articulation is really only there to get the guitar positioned just right. There's also a joint in the microphone stand mid-way, but since you can't position the microphone end in any way, it has only limited usefulness. How many accessories there are depends on how you want to count them. The stage actually comes in three pieces, but I'm counting that all as one. Then there's the chair and microphone stand, both of which attach to the stage - I'm counting them as two more. 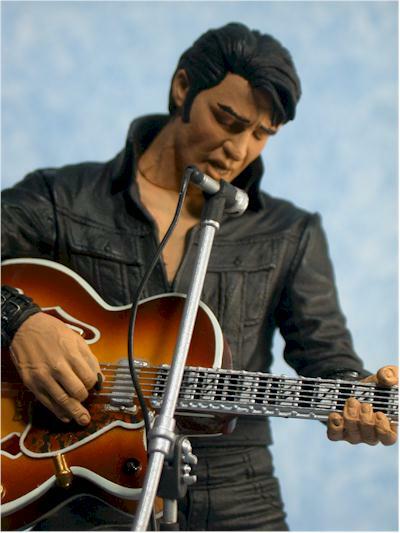 And then there's Elvis' guitar and the microphone itself, which are both completely removable and true accessories. It seems that McToys decided on several figures recently, including the latest Alien and Predator figures, to skip some accessories and bases that had been planned. That's true with Elvis as well. In the pictures and descriptions, there is a backdrop to the stage behind the Elvis name. They dropped it at the last minute. Unlike the dropped items with the Predator and Alien figures though, I think this time it was a smart move. This figure looks better when you can see it from all sides, and the backdrop would have detracted from the overall appearance. That doesn't mean I don't feel stiffed by the lack of accessories and bases with the AvP figures though! The detailed sculpting and paint ops on all the accessories is simply amazing. There's a reason McToys wins best sculpting awards every year from the fans, and work like this is it. The base has a sheet of plastic over the white 'tiles', and I'm assuming it's there to give the floor that shiny, acrylic look. 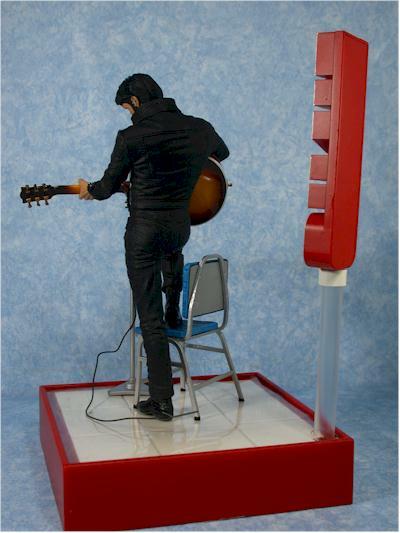 There are holes for the Elvis name sign in back, the chair and the microphone stand. They are all in just the right spot, and Elvis snaps in tightly but lines up perfectly. I could have done without the cord for the microphone - since it has no were to lead it's not particularly useful - but otherwise thought the work on the display stand and accessories was excellent. Be careful when snapping the pieces in though, as it would be pretty easy to break either the chair or the microphone stand. This isn't a toy - it's an inexpensive statue. It's not intended for play, and as such it's not surprising that the fun factor isn't real high. I'm hoping we see these for ten bucks each, and at that price they are a nice, solid, middle of the road value. Nothing to wake up in the middle of the night and write Grandma about, but nothing to feel ripped about either. Jack this price up to $12 or $13, and drop another half star. My overall score is based on the fact that I knew this wasn't intended as an action figure, and because making a highly articulated Elvis isn't as high on my list as making one that looks excellent. While I like as much articulation in my figures as possible, I can forgive Mcfarlane here due to the nature of the property. You might not be so forgiving though, and so your overall score may end up effected much more by the poor articulation score. And if you haven't seen the show, and are wondering what all the hoopdedoo is about, it's available on DVD as well. There's a special 3 disk set coming out on June 22 with a ton of bells and whistles! 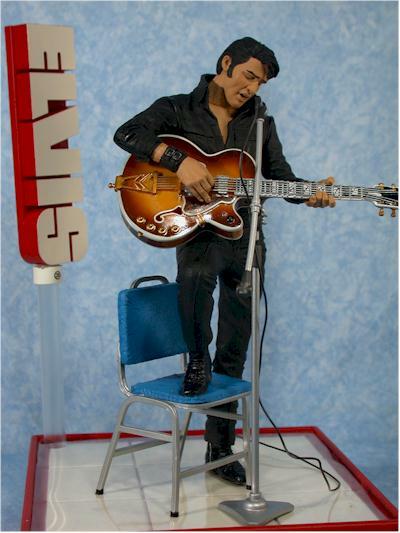 - Killer Toys has all the Elvis figures up for pre-order for $11.95 each. Figure from the collection of Guy Klender.